Stella Maris, in association with Louisiana Public Broadcasting and New Orleans PBS Station WLAE, is pleased to announce that Hand of the Master: The Art and Life of Dom Gregory De Wit will make its television debut this Sunday, November 18th, 2018 at 7 PM CST. The film has already proven to be a run-away success in festivals and local screenings, but this occasion marks the first time that Stella Maris will reach broadcast audiences. Southern Screen Lineup Announced! Hand of the Master is headed to Lafayette, LA! Stella Maris’ newest film, Hand of the Master: The Art and Life of Dom Gregory De WIt will screen in Lafayette, LA on November 11th at 12:00 PM as part of the Southern Screen Fest. Learn more about Southern Screen here! The upcoming Covington, LA premiere of Stella Maris’ newest film, Hand of the Master, landed on the front page of the Times Picayune Newspaper. "Hand of the Master: The Art and Life of Dom Gregory De Wit" - the 55-minute documentary Stella Maris produced - will screen Oct. 24 at 7 p.m. at the St. Tammany Art Association's Art House, 320 N. Columbia St., Covington. Admission is free for STAA members and $5 for non-members. As director of the film, Warren will attend and conduct a question and answer afterward. Read the full article at Nola.com. Hand of the Master Accepted into Southern Screen Film Fest! 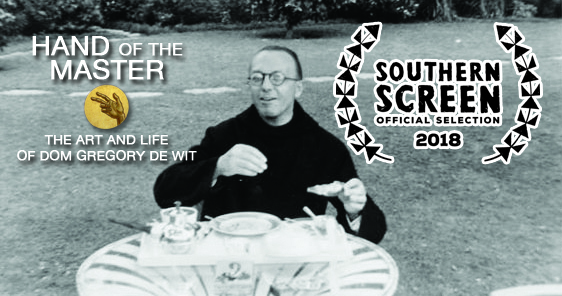 Stella Maris is pleased to announce that it’s newest documentary film, Hand of the Master: The Art and Life of Dom Gregory De Wit has been chosen as an official selection of the 2018 Southern Screen Film Festival! The festival takes place November 7th-11th in Lafayette, Louisiana and showcases the finest films from the South! The festival lineup and more information will be available here. Hand of the Master will screen with PFF! Hand of the Master is coming to the Louisiana Northshore! The documentary will screen at the St. Tammany Art Association on Wednesday, October 24th at 7 PM. Tickets are $5. Info below! The Pontchartrain Film Festival is screening a curated selection of four award-winning documentary films with community partners on a tour that brings documentary films to Mandeville, Covington and Abita Springs for special screenings in the months leading up to festival weekend. The documentaries are made by Louisiana filmmakers, or are on subjects of interest to Louisiana residents. Now in its second year, the tour is an opportunity to bring documentary films and filmmakers into settings for interaction with their audiences, and for discussions about the films' subject and the filmmaking process. Stella Maris’ newest film, Hand of the Master: The Art and Life of Dom Gregory De Wit has been seen by hundreds of audience members in New Orleans and Baton Rouge and the response has been overwhelming! The Brothers at St. Joseph Abbey, where De Wit painted some of his most iconic work, were fans too! They hosted a private screening for the monastic community, along with director David Michael Warren. Stay tuned for more information and announcements about upcoming festival screenings and events! Two Chances to see Hand of the Master! 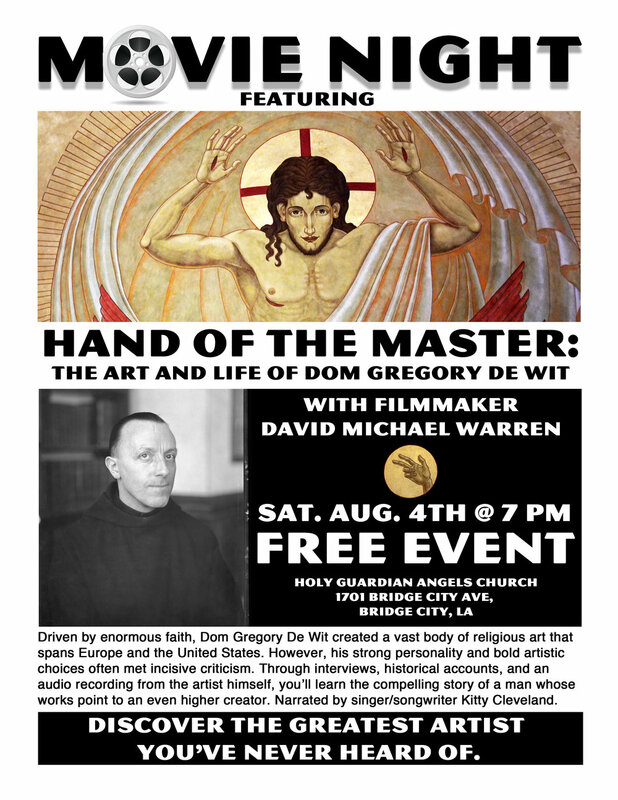 Louisiana residents will soon have two chances to see Stella Maris' newest film, Hand of the Master: The Art and Life of Dom Gregory De Wit on the big screen. The event is free of charge and DVDs will be available for sale. Filmmaker David Michael Warren will attend both events to meet viewers and answer questions about the project. The first event will be hosted at Holy Guardian Angels Church in Bridge City, LA on August 4th at 7 PM. The second event will be held at Sacred Heart of Jesus Catholic Church in Baton Rouge, LA on August 18th at 5:30 PM. Sacred heart Church is home to some of De Wit's most iconic work. If you plan on coming on the 18th, be sure to RSVP according to the directions at the bottom of the flier. Trailer Arrives for "Hand of the Master"
Stella Maris Productions has finally released a trailer for the much-anticipated documentary, Hand of the Master: The Art and Life of Dom Gregory De Wit. The film tells the story of a Benedictine monk and artist who painted an incredibly vast body of work in the United States and Europe. Check out the trailer and be sure to let us know what you think in the comments below! Slow Dance heads to Italy! Slow Dance With Me was named an Official Selection of The 2017 Geo Film Festival and Cinema Expo. The film festival will take place on November 9th in one of the most famous walled cities in Italy, the Citadella. The festival has hosted other films and filmmakers that have gone on to win Academy Awards and participated in the Cannes Film Fest. Slow Dance was selected from 920 short films that were submitted from 52 countries around the world. This event marks Stella Maris' first international screening. Stay tuned for more! 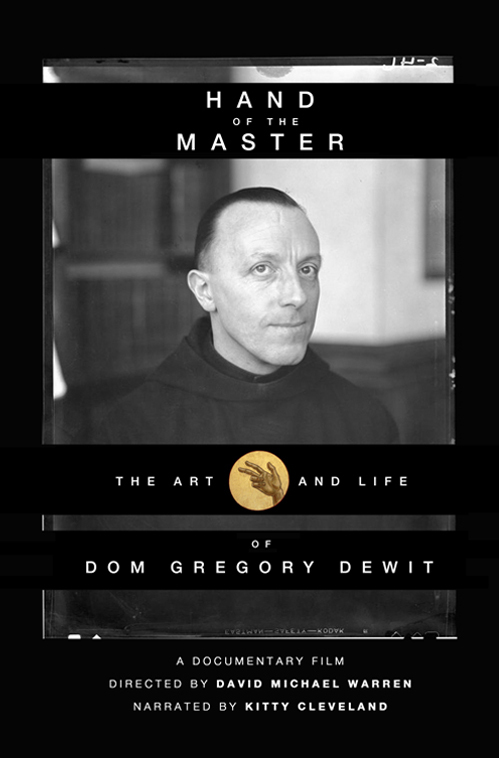 Stella Maris announces new film, "Hand of the Master"
Stella Maris is pleased to announce its forthcoming documentary project, Hand of the Master: The Art and Life of Dom Gregory De Wit. The project was produced over the summer of 2017 and features in-depth interviews, rare photos, and never-before-seen footage of the iconic monk-artist Dom Gregory De Wit. The film required the assistance of churches and abbeys throughout the United States and Europe where De Wit made his mark. The film is narrated by renowned singer/songwriter Kitty Cleveland. You can read the full synopsis of the project and sign up for updates here. This Sunday, Slow Dance With Me was recognized as "Best Louisiana Short" at the UNO Film Fest. The award comes as yet another recognition of the talented cast and crew behind this incredible project. Stay posted for more updates! Slow Dance With Me will be screening this Sunday May 14, 2017 in New Orleans as part of the UNO Film Fest. The UNO Film Festival is hosted in the Robert E. Nims theater in the Performing Arts Center on UNO's Lakefront Campus. UNO boasts a terrific 4K Projector and state-of-the-art sound system. This is a terrific opportunity to see Slow Dance and a ton of other great short and feature films on the big screen. Best of all, the Festival is entirely Free to the public! Stella Maris filmmakers Walter Schneider and David Michael Warren were recognized along with five other Louisiana finalists for the #CreateLouisiana French Culture Film Grant at the New Orleans French Film Fest. They were given an hour to pitch and discuss the development of their new documentary Servant Saint: The Life of Henriette DeLille with some of Louisiana's top entertainment industry professionals. The competition was fierce, and although Stella Maris didn't take home the prize this time, David and Walter were honored to make it to the final round of selections. All of the finalists were recognized for their visionary creative work. Congratuations to our friends at Fablehouse.tv for taking home the win! "Servant Saint: The Life of Henriette DeLille" is a new documentary under development here at Stella Maris. The film tells the incredible, true story of woman from antebellum New Orleans who dedicated her life to serving the forgotten of society. The proposed project has been named as one of six finalists for the #CreateLouisiana French Culture Film Grant. Be sure to check back soon for updates, concept art, and more details on the project! Stella Maris Productions is honored to recieve recognition from the New York Jazz Film Festival as their choice for Top Short! The international festival was hosted in the heart of downtown Harlem and celebrated the spirit of jazz and its influence on the world. Films were selected from the United States, Brazil, France, Australia, Germany, Spain, Japan, Iran, and across the UK. This festival, in the heart of Harlem, is a celebration of jazz. Jazz music is at the heart of the film that we’ve made, and jazz can convey raw emotion and spontaneity in a way that other mediums simply cannot. But what is jazz, if not a celebration of the country where it was born? What is Jazz, if disconnected from the very people who made it, who sung it, who felt its smooth sounds send soothing waves deep into their souls? I never had the pleasure of meeting my grandfather. He passed away before I was born and all that I know of him can be encapsulated in a pair of dog tags, a few photographs, and stories that my mother tells me about his heroism in WWII. One night, I had a vivid dream about my grandfather coming home from war. When I woke up, I wrote down everything that I had envisioned. I soon realized that I was holding something very special; a script for a short-film called “Slow Dance With Me”. I was fortunate enough to recruit the help of four fellow SCAD alumni, who are working film professionals. This included Walter Schneider, whose production design work has recently been nominated for an Academy Award, an Emmy, and an Art Directors Guild Award. Walter and I personally raised funds, conducted research, held auditions, created a historically accurate 1940s Americana set, and assembled a crew of passionate film industry professionals. We also spent a great deal of time listening to jazz, finding the perfect song that would emulate the feelings of a young bride longing to dance with her husband. We hope you will agree that the jazz ballad “Very Exceptionary” was the right choice. Although our film is only about five minutes long, I would humbly suggest that it manages to capture tremendous sentiment. Further, I believe that it is a fitting tribute to all of the brave service men and women who have fought for our freedom. It is a tribute, like jazz, to America. This recognition marks the first festival win for Stella Maris Productions. Click here to see the full lineup of winners. Loyola University College of Music & Fine Arts recognized the success of recent alum and Slow Dance With Me lead actress, Emily Gyan. Citing her career as an actress, a singer, a Victory Belle at the National WWII Museum, and model, the article applauds Emily's tremendous work ethic and her dedication to her craft. The article continues as Emily describes her experience working with Stella Maris. Gyan has had success beyond her work as a Victory Belle although much of it seems to revolve around the same era. One of her most recent projects includes her work on a short film about young love during World War II called “Slow Dance with Me,” written and directed by David Michael Warren, released earlier this year on Amazon Prime. We couldn't be more proud of Emily's success. You can read the full article here. The Slidell Independent and Tammany West newspapers both covered a story about the success of Stella Maris' short film, Slow Dance With Me. Stella MarisFilms, formed in 2013, was selected as one of the companies to show off their new short film, “Slow Dance with Me,” which will be among a host of incredibly interesting, unique and still mostly unknown films at the fifth annual Pontchartrain Film Festival, which will be held this Friday and Saturday, Nov. 4 and 5, at the Mandeville Trailhead. Walter Schneider and David Warren discuss their experiences making Slow Dance With Me. Warren went on to describe his personal experiences in the film industry and what led him to start Stella Maris Productions with his partner, Walter Schneider. For the young married couple it wasn’t their ideal way to have a life together, which now includes a 4-month-old son who has joined the family. Schneider, 29, became a friend to Warren when they both attended the Savannah College of Art & Design. Since that time, Schneider has received tremendous acclaim for a young industry man of his own. His 2014 work on the film, “12 Years A Slave” was nominated for the Academy Award for Best Production Design, and his work on the 2015 film, “Trumbo,” was nominated for the Art Director’s Guild Award for Excellence in Production Design. He has also been recognized by two Emmy nominations in Outstanding Art Direction. Both young filmmakers moved to St. Tammany Parish several years ago when the state was creating more films with special state tax incentives, many of which were reduced tremendously in the past legislative session. Professional dancer Mary Seghers recently sat down to share her experiences choreographing Slow Dance With Me. You can read more about Mary's experience working with Stella Maris on her website by clicking here. Mike Huckabee applauds "Slow Dance With Me"
Former governor, presidential candidate, and bass guitarist Mike Huckabee recently enjoyed a screening of Slow Dance With Me. In an email to the film's producers he called the film "excellent" and praised it for its powerful message. He even took the time to mail director David Michael Warren a personal note explaining that he's seen the Victrola featured in the film before! Check out the note below. "Dear David, Thanks for sending the film- well done! I have an old Victrola identical to the one in the film that was my mother's. You told the story very effectively! God Bless! -Mike Huckabee"
Slow Dance With Me has been accepted for screening at the Annual New York Jazz Film Festival! This year, the festival received approximately 400 films from around the world and ranked Slow Dance With Me as one of this year's best. The New York Jazz Film Festival provides a unique platform for jazz musician-actors, directors and writers pursuing content related to jazz, to network with their peers and have their work seen. The Festival will be held on November 12-13, 2016 at the Adam Clayton Powell Jr. State Office Building Art Gallery in historic Harlem! Slow Dance With Me is Scheduled To Screen on November 12, 2016 at 5:30pm.